Many, though not all, of the plant-based herbal remedies that we use for humans can also be safely used to treat dogs and cats. The tricky part is getting them to take them! 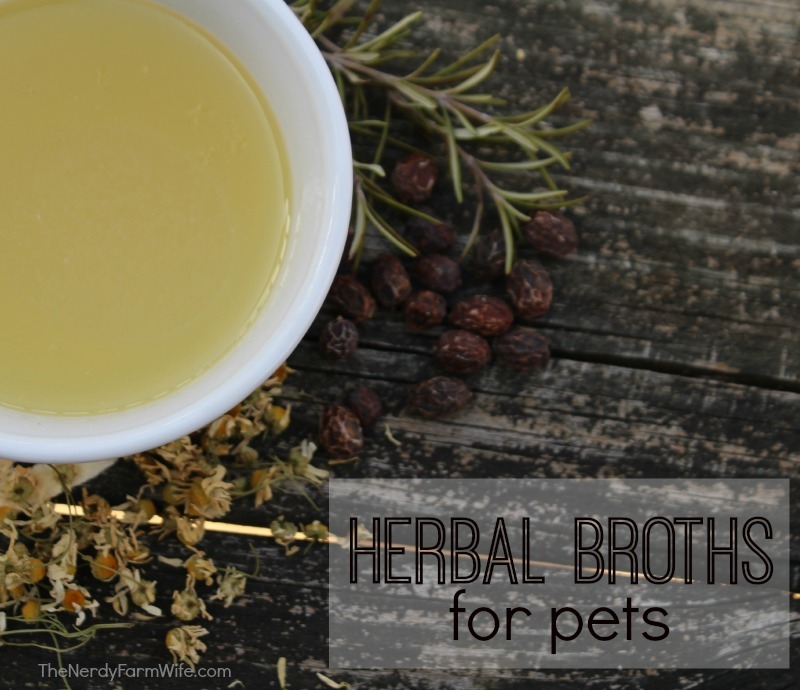 To encourage compliance, I make my pets an herbal tea of sorts, using broth instead of water. Before I detail how and offer some suggested herbs, I want to be clear that I am not advocating that you replace your vet completely with home remedies. Always do your own research before following the advice on any web site, even mine. If in doubt or if you suspect serious illness, check with your vet. Above is a photo of my rescue kitty, Rascal. Last year, he became very sick. 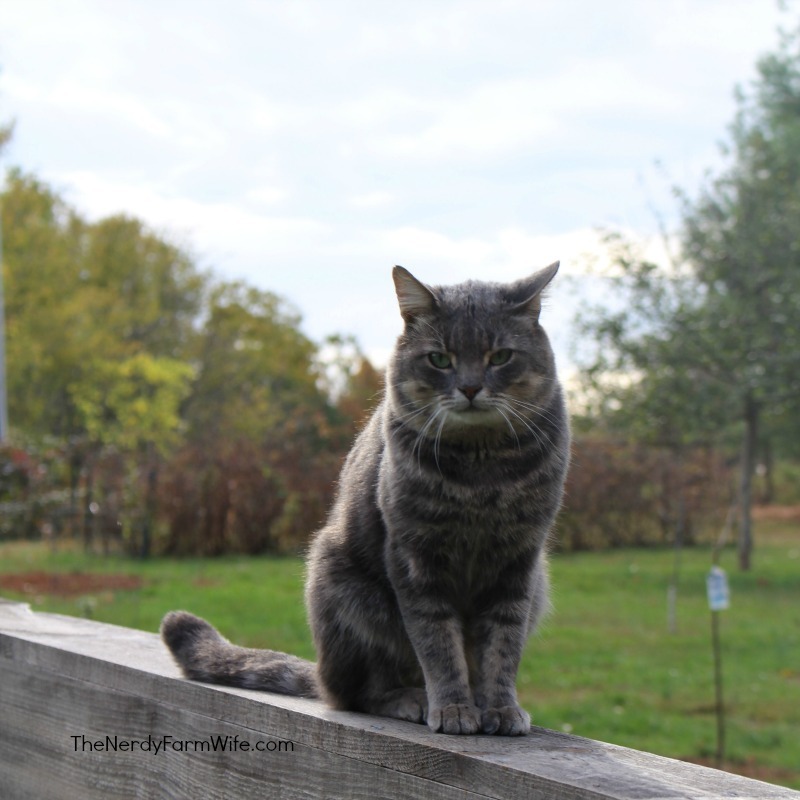 He lost visible weight, started moving stiffly, and refused to eat. It was one of those weeks where we weren’t even sure where grocery money would come from and had no way to afford a vet. I made a big pot of chicken broth infused with a generous amount of dried astragalus root and brought him little servings every couple of hours over the next two days. It was the only thing he would consider eating. Over the course of the first day, we didn’t see much difference in his overall demeanor. By the end of day two however, he was grooming himself again and by the morning of day three, we could tell he was returning to his rascally little self! I know when I sip on chicken broth laced with astragalus root, I detect a noticeable sense of improvement in energy levels and feelings of well being. I have no doubt that Rascal’s treatment helped perk him up and possibly even saved his life. 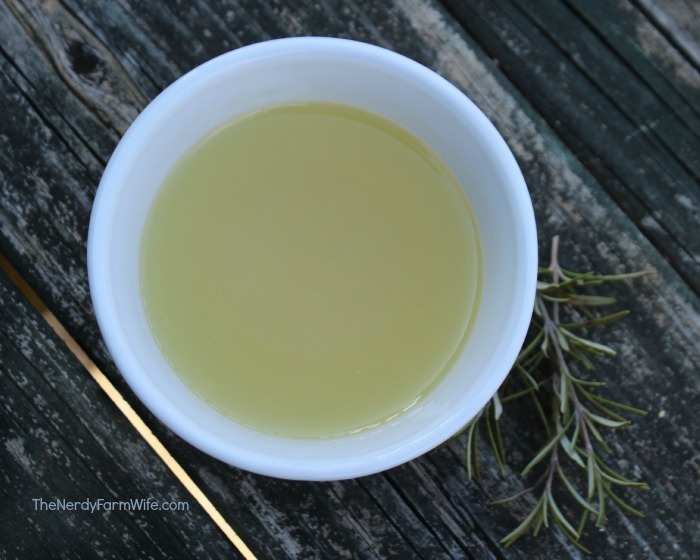 To make this herbal remedy, you’ll need to create a nourishing broth base to work from. Don’t use canned broths from the store, because they usually have added ingredients that might not be good for your pet plus far too much sodium. This needs to be homemade. I typically wake up in the morning, place a few thawed chicken parts in a pot, cover with water, add a splash of apple cider vinegar and a pinch of Himalayan salt or Redmond’s Real Salt. Don’t use ordinary table salt. 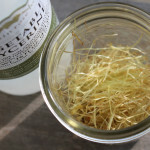 I almost always add a few pieces of astragalus root. It’s a funny looking herb with a funny sounding name, but it’s one of my can’t-live-without herbs. There’s a bit more about it, in the list below. Do not add onions or garlic. Onions are especially harmful to both dogs and cats and garlic is sketchy, depending on who you ask. (So I avoid it to be safe.) You can however, throw in a handful of carrots. Let this simmer all day, or even up to 24 hours, then remove from heat and allow to cool for about 20 minutes before straining and storing in your refrigerator for up to two or three days. Alternatively, you can freeze small portions for up to six months. When you’re ready to make your herbal broth, reheat about five or six ounces of stored broth in a small saucepan until simmering. Place a small pinch each of the desired herbs in a small, heat proof jar or container. Pour the broth over the herbs and let steep for about ten minutes. 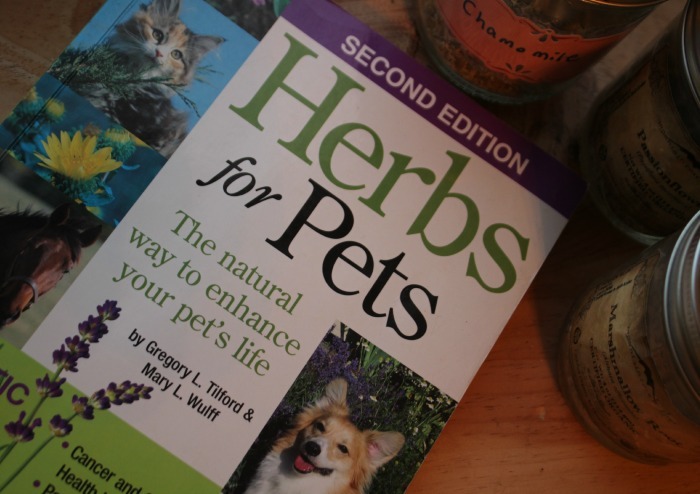 I use the Herbs for Pets book by Gregory Tilford & Mary Wulff to help me determine which herbs are safe to use. I highly recommend having this book in your home library if you plan to treat your pets naturally. I love my copy! If you’re not sure a particular herb will be safe for your pet’s condition or they have signs of serious illness, call your vet and double check. Note that I am using very small amounts of dried herbs. 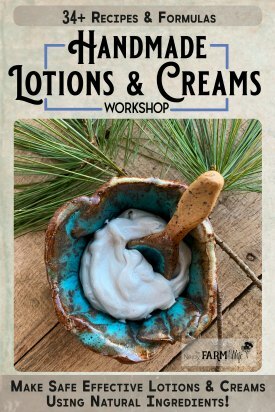 Do NOT use extracts and do NOT use essential oils. I grow some of these herbs or purchase from Mountain Rose Herbs or Bulk Herb Store. Want more natural remedies? 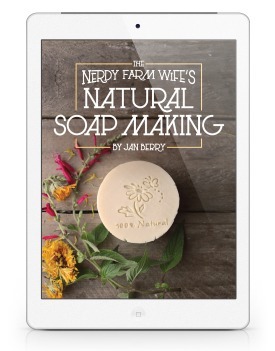 Be sure to sign up HERE for my newsletter, so you can get my latest soap ideas, herbal projects and other DIY recipes sent straight to your inbox each month! Great post! Thank you for this information. I just spent 20 minutes and 3 slices of ham trying to “hide” my dog’s heart worm medication inside. That’s always the trick – getting them to actually take it! Yes, it is very tricky to dose up our furry friends! :) I’m glad you liked the post! Great idea – thanks for sharing Tracy! A good book to own in case the ducks I don’t yet have should get sick! Thanks for the excellent information, Jan. Thank you for this article.I have an Mini Australian Shepard that was diagnosed with Cushings disease. The Vet wanted us to wait to start treatment until she reached a certain threshold at drinking water. We got on the internet and looked into as much information as we could find about the disease.In looking I found an article on herbal supplements and Cushings and eventually finding a company called Pets Alive that have Cushex Drops for Cushings so while waiting for our dog to get worse to start treatment as the vet suggested we started her on these drops. Some symptoms like loosing the hair on the back of the legs and stomach and drinking large amounts of water disappeared. Actually the drinking of water never got worse.. We had a visit with the vet about 6 months later and we told her what we did.. she said to keep her on the drops since she is doing ok on these drops and if the symptoms return to alert the vet. It has been almost a year and so far so good. Not on medication from the vet yet. So we are avoiding this for now. I will say our dogs Cushings is Pituitary and is inoperable, there are 2 kinds of Cushings, in dogs. I will say I am sure this may not work with all dogs with Cushings, but it so far has worked for out dog. So thanks again for your information. Wow, that’s great that you found something to help her! I just looked the drops up and see they have my well-loved herb astragalus in there. So great for pets (and people!) :) I hope your dog continues to do well! Hi T! 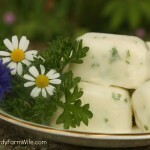 I get virtually all of the herbs I can’t grow myself from Mountain Rose Herbs or Bulk Herb Store. 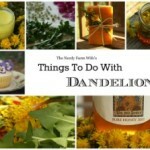 Their links are right below the list of herbs I most commonly use (in the article above.) I tried Jean’s Greens a few months ago too and the shipping was super fast. I also like how you can buy as little or as much as you like. I plan to buy more from them in the future! That link is jeansgreens.com I believe. Thank you so much for the information!! Thank you so much for being so generous with your recipes and knowledge. I plan on purchasing some astragalus to make this for my lab. I am also interested in remedies for my girls (chickens). I make warm oatmeal with flax seed, sunflower seeds, strawberry tops and pieces and any greens I have on these cold winter mornings. They are spoiled and come running to the corner of their lot when I open the basement door. I use apple cider vinegar in their water to help immune system, but have had some that get respiratory problems. I hope you’re able to find some for your little kitties! It really is a wonderful herb. Great post, Jan! I’ve been wondering how to treat my kitties with herbs, but been too concerned about safety to try. Love this post. I’ve ordered the book (it’s on back order, I think) and am choosing this post as my favorite for the blog hop this Friday. Hi Kristi, Thanks so much for choosing it as your favorite! :) I think you’ll find the book really helpful too – I find myself referring to it often. First, I want to say THANK YOU for all the Incredible, wonderful Information & education!!! I’m a Nurse, and I have always been into Herbal Medicinal remodys… My Great Grandma used them always and I was Blessed to have her in my life! She was amazing! And when ever I would get sick, her Treatments ALWAYS Cured me FAST!! And the best part about it all…. NO SHOTS !! LOL! Back then, they were Quick with giving injections! Anyway, THANK YOU for your gifts & Talents You share!!! I LOVE THEM ALL!!! Hi Marykaye, Thank you for the kind words! :) The book I talked about in the article – Herbs for Pets – has this ear oil recipe that might help: combine the following – 1 part garlic oil, 1 part mullein oil. For every ounce of oil that you make, add 10 to 20 drops of vitamin E oil. It’s an excellent book, full of great advice and has always steered me well, so I hope that helps your little grand dog! Thanks!! !and, I just ordered this book thru your link!! I appreciate the remedy, I won’t have the book for a few days and I’m hoping this will help!! Going to make it up tonite and start the treatment in the morning! I’ll let you know how things turn out!! Thanks again!! Have a Great Weekend!! Thanks for using my link to order! I hope that the drops will help & would love to know how they work out for you. Have a great weekend as well!